The PRIMHD Standard comprises the following three documents. These documents should be read together. Their separation is solely to simplify the structure of the standard for ease of use. The standards are designed to promote interoperability of information systems within the health and disability sector. 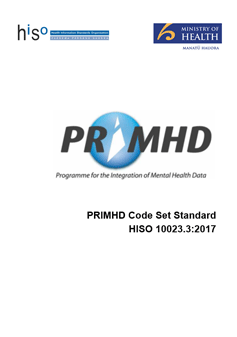 This document defines the common set of codes to be used for each data element of the Integrated Mental Health Collection (PRIMHD) data set that requires coding. The adoption of a common code set for the health sector will reduce the need for complex interface programmes to translate or manipulate data being exchanged. It will also contribute towards creating a common understanding of data, thus allowing better analysis and interpretation. These are codes or values that are used throughout the health sector, such as codes for ‘Title’ (Mr, Mrs, etc or organisation name, etc). These need to be used consistently. These are specific to mental health and addiction services, eg, HoNOS. Please see the PRIMHD section for the latest file specification and requirements. If you have any queries please contact the appropriate person at PRIMHD contacts. Ministry of Health. HISO 10023.3:2017 PRIMHD Code Set Standard. 2017. Wellington: Ministry of Health.